This Goza (traditional straw mats) is created in the Chikugo area, Fukuoka prefecture. Its nickname, Hanagoza (meaning flower goza) derives from its renowned splendidness. As with Nishijin textile, goza is made using Jacquard mechanism which means that it is possible to create diverse patterns. All of the making processes of this goza is done in Fukuoka including colour dying and weaving. More importantly, the charm of goza lies not only in its splendor but functions and qualities it holds. For instance, igusa (soft rush), that is the material for goza, absorbs twice as much as cotton which that if you sweat the material will absorb it quickly which means that when touched it keeps the skin smooth and dry. The sponge-like quality also enables igusa to absorb formaldehyde, a compound known to be harmful to human health such as carcinogenic effects, meaning that there will be less exposure of this in the air. Moreover, there are many other health benefits with using igusa such as it including phytone, which is similar with vanillin found in natural woods. This means that the material can physically bring relaxation to the space it is placed. 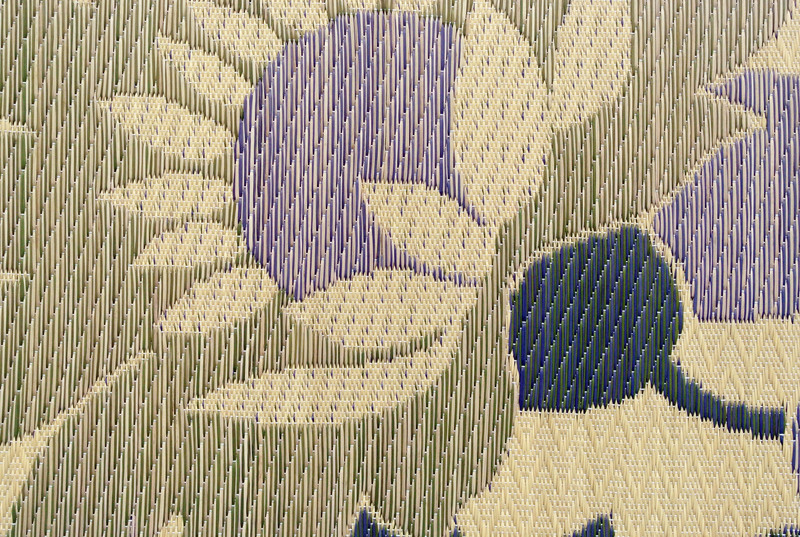 Using igusa produced in Kyushu region, this material requires jacquard to create the diverse complicated patterns. 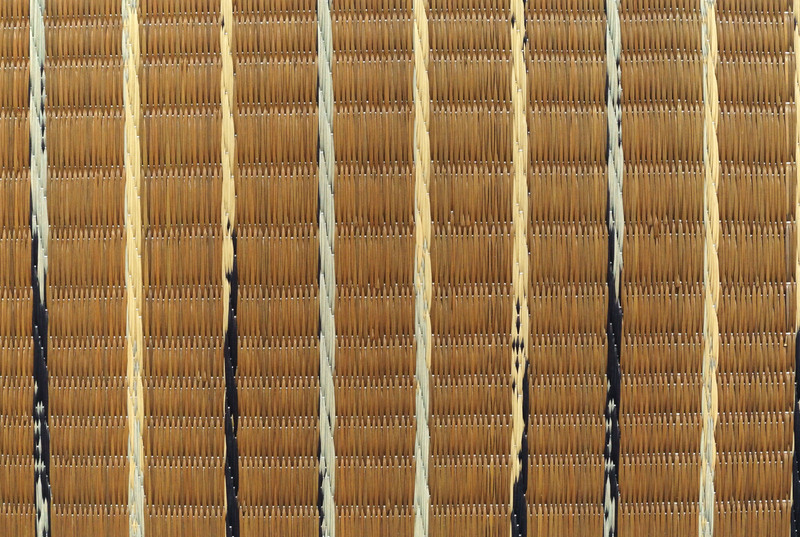 The double weaving method in the production process requires roughly 100 more threads than Monori (the standard figured textile with roughly 200). Due to its qualities, the pattern on the front surface of this material is different from the back so you can enjoy two variations of the pattern. Also regarding the patterns, double weaving enables not only straight lined patterns but can express curvy lines as well. Due to its layers, this material has high durable qualities. 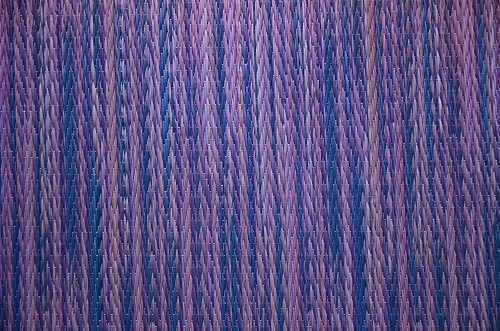 Recently, we can find triple or quadruple layered weaving which could make rich and firm looking patterns meanwhile its use of many warps and layers makes elegant details possible. 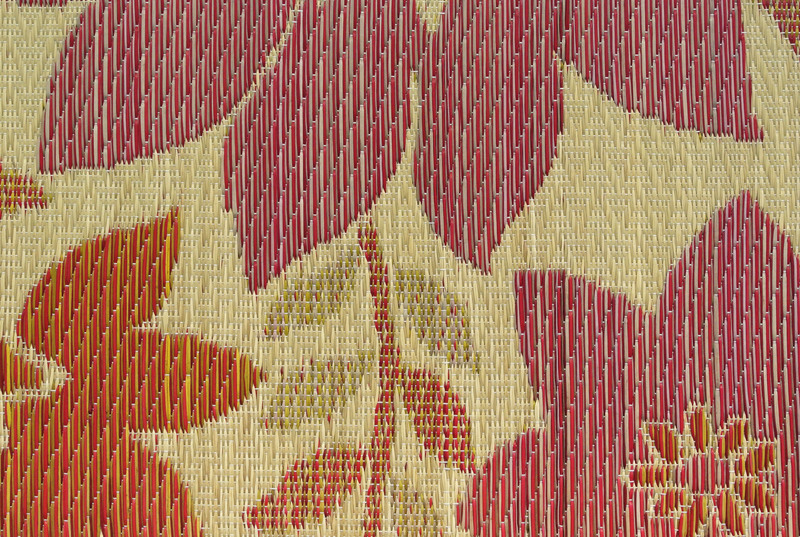 Using igusa produced in Kyushu region, this material requires jacquard to create the diverse complicated patterns. Monori is a method of weaving also known as a standard way of weaving many patterns by skillfully arranging the weft in the openings of warp. An originality of Fukuoka prefecture and the finest quality of goza (traditional straw textile) from its exquisite simplicity is the Kakegawa-ori. It has a sequence of roughly 3cm of texturing followed by 1 cm of smaller texturing.